Recently, when faced with a challenging application to assemble, tack weld and subsequently hermetically seal a Mercedes front indicator assembly, the Aldershot based company turned to Ultrasonics specialist Telsonic UK for assistance with the joint design and the configuration of a production solution. This specific application requires an acrylic lens to be joined to a polycarbonate / ABS housing, which in turn incorporates LED’s and a control PCB. The finished assemblies, both LH and RH variants, have to be hermetically sealed. The technical challenges to be overcome here included the fact that this would be a two-stage process, initially creating a tack weld to secure the inner moulding, before completing the final weld on the lens and hermetically sealing the part. This was achieved using the same sonotrode and changing the weld data set on the microprocessor as required for the two different joining processes. A further challenge was the need to achieve consistent weld integrity over the full 500mm length of the part, whilst catering for the differential in height across the contoured surface of the component. 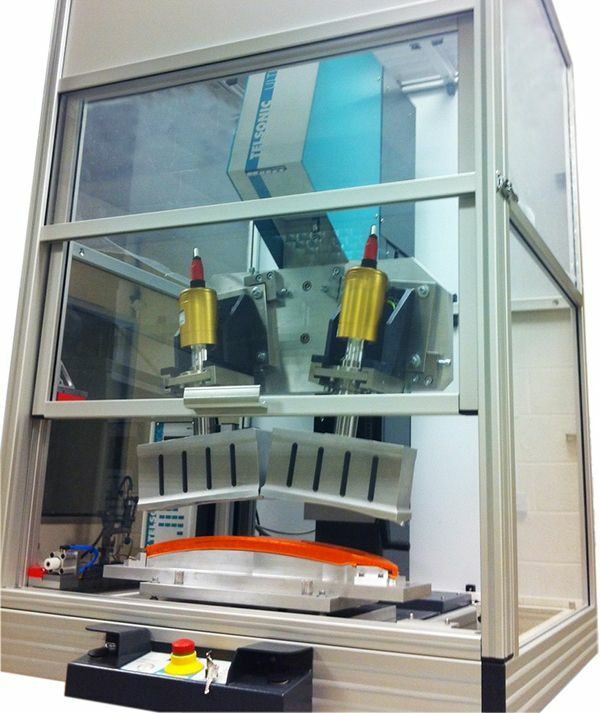 PEREI and Telsonic UK engineers worked together to define the optimum solution to the application, which included an innovative configuration for the ultrasonic stacks. This is based upon a bridging plate, onto which the two separate ultrasonic stacks are mounted. These in turn are driven by a single MPS4 controller and a master / slave DHG generator system, allowing simultaneous horn operation and achieving the required weld over the full length of the part in a single cycle. The system supplied by Telsonic UK is based upon a stand-alone, fully guarded machine incorporating a USP 3000P press unit and quick-change 3D profiled aluminium anodized component nests. The bridging plate for the ultrasonic stacks maintains the quick-change concept, ensuring high productivity and uptimes. When operating, the system uses less than 1000Ws(Joules) of energy, welding in constant energy mode and completes the welding cycle in 1.5 seconds. Now in full production, this compact machine is an excellent example of collaboration between the machine and technology supplier, in this case Telsonic UK, and customer engineers. Designed and built with longevity in mind, this system will continue to deliver a reliable, cost effective and environmentally friendly alternative to traditional adhesive bonding.